Warning! GuruFocus has detected 9 Warning Signs with TOT. Click here to check it out. Total SA (TOT) shares are trading around $58 with a price-sales ratio of 0.94 and a price-earnings ratio of 15.95. The integrated oil and gas company has a market cap of $157.58 billion. The stock has risen at an annualized rate of 6.6% over the last 10 years. The discounted cash flow calculator gives the stock a fair value of $48.15, suggesting it is overpriced by 44%. 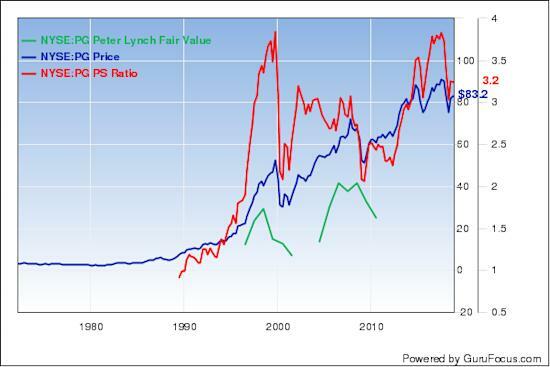 The Peter Lynch earnings line gives the stock a fair value of $27.30. The T Rowe Price Equity Income Fund (Trades, Portfolio) is the company's largest shareholder among the gurus with 0.28% of outstanding shares, followed by Pioneer Investments (Trades, Portfolio) with 0.17% and Ken Fisher (Trades, Portfolio) with 0.02%. Granite Construction Inc. (GVA) shares are trading around $40 with a price-sales ratio of 0.53, a forward price-earnings ratio of 9.05 and a price-earnings ratio of 27.36. The company, which is involved in the construction of streets, roads, highways, airports and other infrastucture projects, has a market cap of $1.82 billion. The stock has risen at an annualized rate of 6.7% over the past decade. The DCF calculator gives the company a fair value of $15.62, suggesting it is overpriced by 156%. 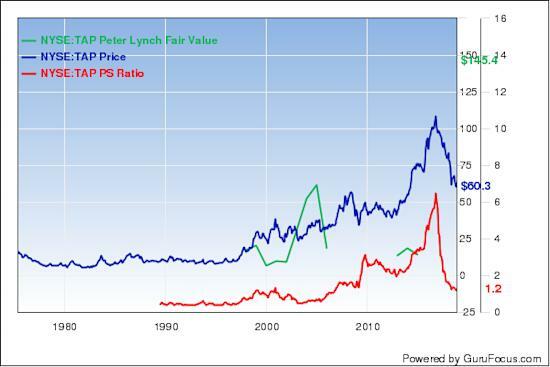 The Peter Lynch earnings line gives the stock a fair value of $13.15. The company's largest guru shareholder is Chuck Royce (Trades, Portfolio) with 1.17% of outstanding shares, followed by Arnold Van Den Berg (Trades, Portfolio) with 0.77%, Jim Simons (Trades, Portfolio)' Renaissance Technologies with 0.46% and Pioneer Investments with 0.44%. Huntington Bancshares Inc. (HBAN) shares are trading around $13.45 with a price-sales ratio of 3.49, a price-earnings ratio of 11.40 and a forward price-earnings ratio of 9.43. The financial holding company has a market cap of $14.28 billion. The stock has risen at an annualized rate of 6.7% over the last 10 years. The DCF calculator gives the stock a fair value of $12.63, suggesting it is overpriced by 6%. 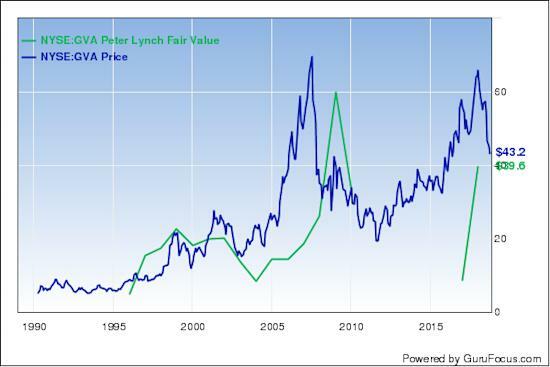 The Peter Lynch earnings line gives the stock a fair value of $16.65. The company's largest guru shareholder is Pioneer Investments with 0.71% of outstanding shares, followed by Simons' firm with 0.08%, George Soros (Trades, Portfolio) with 0.05% and Mario Gabelli (Trades, Portfolio) with 0.02%. Umpqua Holdings Corp. (UMPQ) shares are trading around $18.87 with a price-sales ratio of 3.49, a price-earnings ratio of 14.54 and a forward price-earnings ratio of 10.71. The company, which provides community banking services, has a market cap of $4.16 billion. The stock has risen at an annualized rate of 6.7% over the past decade. The stock has a fair value of $13.91 according to the DCF calculator, suggesting it is overpriced by 36%. 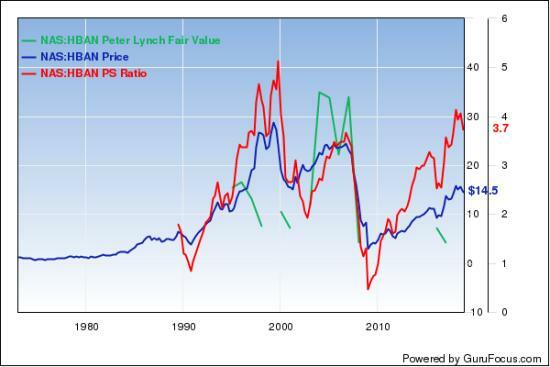 The Peter Lynch earnings line gives the stock a fair value of $18.90. The company's largest guru shareholder is Fisher with 1.63% of outstanding shares, followed by Simons with 0.28%, Richard Snow (Trades, Portfolio) with 0.27% and Royce with 0.21%. Molson Coors Brewing Co. (TAP) shares are trading around $57.86 with a price-sales ratio of 1.15, a price-earnings ratio of 7.89 and a forward price-earnings ratio of 11.72. The brewer has a market cap of $12.51 billion. The stock has risen at an annualized rate of 6.7% over the last 10 years. The DCF calculator gives the stock a fair value of $90.37, suggesting it is undervalued with a 36% margin of safety. 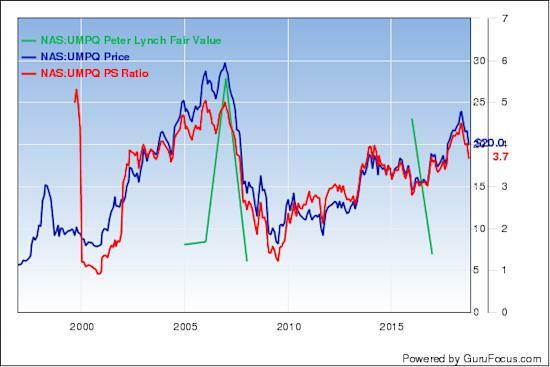 The Peter Lynch earnings line gives the stock a fair value of $103.05. The company's largest guru shareholder is Diamond Hill Capital (Trades, Portfolio) with 1.81% of outstanding shares, followed by the Dodge & Cox with 1.47% and Lee Ainslie (Trades, Portfolio) with 0.5%. Procter & Gamble Co. (PG) shares are trading around $88.39 with a price-sales ratio of 3.44, a forward price-earnings ratio of 20.37 and a price-earnings ratio of 24.09. The consumer goods company has a market cap of $214.55 billion. The stock has risen at an annualized rate of 6.8% over the past decade. The stock has a fair value of $39.27 according to the DCF calculator, suggesting it is overpriced by 125%. 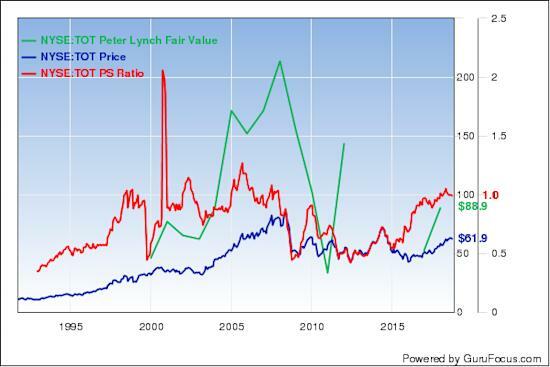 The Peter Lynch earnings line gives the stock a fair value of $56.40. With 0.62% of outstanding shares, Yacktman Asset Management (Trades, Portfolio) is the company's largest guru shareholder, followed by Fisher with 0.4%, the Yacktman Fund (Trades, Portfolio) with 0.25%, Pioneer Investments with 0.25% and the Yacktman Focused Fund (Trades, Portfolio) with 0.19%.